emergency shelter of the Solvay hut (4003m/13,150ft). This beautiful photo is courtesy of Cosley and Houston Alpine Guides. 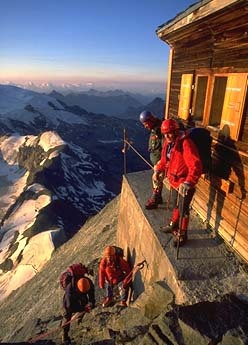 Cosley and Houston offer a worldwide climbing service, including regular visits to the Matterhorn and other European peaks. Visiting Zermatt? Hike to the spectacular "Matterhorn base camp" with the Zermatt Walking Guide.